Jostaberry (Ribes × nidigrolaria): growing, planting, caring. 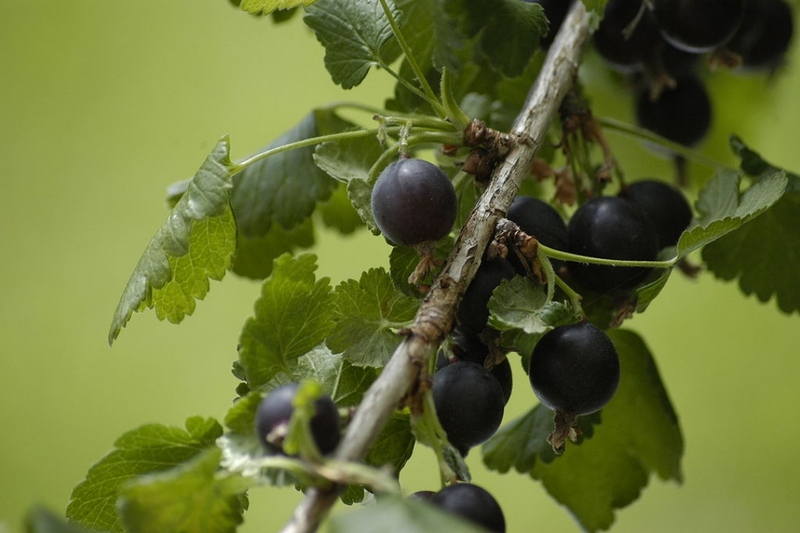 The jostaberry - Ribes × nidigrolaria - is a complex-cross fruit bush in the genus Ribes, involving three original species, the black currant R. nigrum, the North American coastal black gooseberry R. divaricatum, and the European gooseberry R. uva-crispa. The plant is thornless and grows to a maximum height of about 2 m, flowering in mid-spring, with fruit setting and ripening on a similar timetable to the blackcurrant. The plant displays hybrid vigor, growing and fruiting well and being resistant to a number of common diseases afflicting other Ribes. In particular the plant is resistant to American gooseberry mildew, blackcurrant leaf spot, white pine blister rust, and big bud gall mite. Flowers are hermaphrodite and the plant is self-fertile following insect pollination. Propagation is usually by cuttings, rather than by seeds. The nearly black berry, which is smaller than a gooseberry and a bit larger than a blackcurrant, is edible both raw and cooked. It is described as having a taste intermediate between a gooseberry and a blackcurrant, with the gooseberry flavor more dominant in the unripe fruit, and the blackcurrant notes developing as the fruit ripens. The ripe fruit will hang on the bush in good condition through late summer, but is very popular with birds. The somewhat unripe fruit can be used in cooking recipes as a gooseberry. Like blackcurrants the fruit freezes well, and like many other members of the genus Ribes it is rich in vitamin C.
You can plant from October to March for suckers in bare roots, and until May for seedlings in containers, but avoid doing it during frost periods. Warning ! You will need several plants to ensure pollination and fruiting, at least two, even of different varieties! The jostaberry likes a sunny exposure but supports the semi-shade, especially if it is leaning against a wall that will shelter it and keep it warm. Itl prefers a slightly acid soil! Remember to weed well before planting, to avoid any risk of competition, especially with weeds and limit invasions and diseases. In a furrow 8 to 10 cm deep, ideally in a north-south oriented line, space each plant 1.5 meters, and also count 1.5 meters between the furrows. Enrich the topsoil with some compost when planting. Warning: do not bury the collar of the plant, it would slow down its growth. Direct the growth of your jostaberries before they become too large, partially to slow their development, which can turn out to be fairly quick, but also to insure optimum fruit production. If you have a full row of raspberries — lucky you ! — plant them in a line marked by small stakes, with wire connected to both sides of the stakes at a height between 40 - 80cm. Leave about 60cm of space between each plant. The jostaberry bushes will grow yet remain contained between the wires, and you'll protect yourself from scratches when you pick them. If you only have one or two plants, you can use stakes to support the stems, but they need to be checked on regularly, even changing the stakes over the course of the season! For best flavour, only pick and eat well-ripened fruits. If your harvest is destined to become jam or pies, there's no point in being delicate about it. Pick the fruits in bunches without sorting them out, you'll have lots for the day. You'll be adding sugar when you cook them anyways, so a few under-ripe berries won't be a problem. Mulch in April to maintain humidity. Water thoroughly and cover with a thick layer of mulch. You can use dried grass clippings, wood chips, bark, straw or dead leaves. Unlike other berry producing plants, jostaberries require quite a bit of water, especially during the first weeks after planting, and during the fruiting period. This need is even greater is they are kept in pots or experience periods of drought. Keep a moist substrate, but most importantly cover the roots with mulch. Depending on the quality of mulch, you may only need to add more on rare occasions. Prune your jostaberries towards the end of winter, ideally in February. Temperatures must be kept mild and dry, with no risk of freezing. Prune extensively: first thin out the centre of the plant as light penetration is a key growth factor, and remove any bent or sickly stems. To rejuvenate aging roots, shorten the entire plant by pruning it's height by 1/3. You may carry out a division at the end of winter. Dig up the plant, separate and remove old roots, and keep only the healthiest cuttings. Transplant the cuttings in light, nutrient rich soil — water copiously for a few weeks. Jostaberries are quite resistant to diseases. Nevertheless, you might be run into powdery mildew, which appears in felty, white patches on all or part of the plant, especially the leaves. Rust fungus causes orange-brown pustules on the undersides of leaves, and aphids will cause leaves to roll up and lose their original color. Keep an eye out for scale insects too! You may make a stinging nettle fertilizer to cure the effects of powdery mildew — you can even find 100% organic stinging nettle fertilizer in garden stores! Aphids feed primarily on leaves, especially in spring. To fight against aphids, adopt some ladybugs! There are lots of ways to get rid of aphids, so try to avoid the old, harmful method of spraying soapy water on fruit bearing plants.